Happy Wednesday! We have made it half way through the week! Yay! Today I want to talk about getting faster! I have a goal this year to PR my marathon time. Here are a few of my tips that are helping me work towards that goal. I would not consider myself to be a “speedy” runner but I’m not the slowest so I think I’m pretty average? I have been working on getting faster but only doing as much as my body wants too. Here are my 6 tips to get faster and preventing injury while training. 1. Start from where you are and not where you want to be- Building a base is important! You can only go as fast as your body is actually ready to go. You could push yourself at the beginning but you run the risk of getting injured. You are running off of your base training that can take months, even years to get where you want to be. Be patient. Be consistent. Be smart. 2. Make gradual change. Along with speed you need to build your mileage slowly. If you haven’t run much in the last 6 months it probably isn’t too smart to run 13 miles your first day back on the asphalt. For me, I train differently because it is just what works for me. Some people like to do 4-5 20+ milers before a marathon. For my first marathon I trained for it. EVERY. SINGLE training run. I think I had and 18, 21, & 23 long runs that I did and I ended up burned out and a nagging hip injury when I got to the starting line. It was terrible. The next marathon I built up and did only 16 miles as my longest run and ended up feeling great and ready at the starting line. Sure, it feels better mentally to get a few LONG runs under your belt, but physically your leaving your best miles out on the training road. 3. Quality trumps Quantity- To progress change one thing at a time. For example, your long runs should be done at an “Easy” effort, but if you head out and do a 20 miler at race pace after a 17 miler “easy effort.” You changed two things- pace & increase of mileage. I recommend avoiding that type of training. Chances are your pushing yourself to the edge a bit. Instead try putting in three to four race pace simulation workouts and cut back the distance. That way you can train at marathon effort, practice your race day pacing strategy, and recover, because the mileage is shorter and of greater quality. 4. Turn off your garmin- I know this one sounds crazy! But this time around I have been leaving my garmin at home and I feel good about it. Let me tell you why. Your body doesn’t know time. It knows EFFORT. Whenever I wear my garmin on my long runs, I feel like I’m glancing down at my pace too much and pushing myself faster just too hit “that pace.” I’d burn myself out for the rest of my week. I pay much more attention now to my effort. I hold a pace that is comfortable for me that day. As a mom/fitness instructor I have good days and I have days where my legs are just tired from teaching or cross training. I schedule my runs around how I am feeling that day. Ill even skip a day if I’m feeling super sluggish. Your not doing yourself any favors by MAKING it do something it doesn’t feel up to that day. 5. Don’t run every. single. day- CROSS TRAIN! Swim, Bike, circuit train with weights/body weight movements. You become a stronger runner through cross training. Believe me on this one. I run 3-4 times a week, because that works best for me. I love running but running every day is rough on my body. Your muscles are pretty dang important to protect your bones, ligaments, and tendons from the constant beating that running puts on you. 6. Practice with your fuel you use on race day. This tip doesn’t necessarily help you get faster.. but it can affect you on race day. Stomach problems=bad race times usually.. practice eating, drinking, GU ‘in as you will be during your race! Hey guys! I hope you had a fun and relaxing weekend! 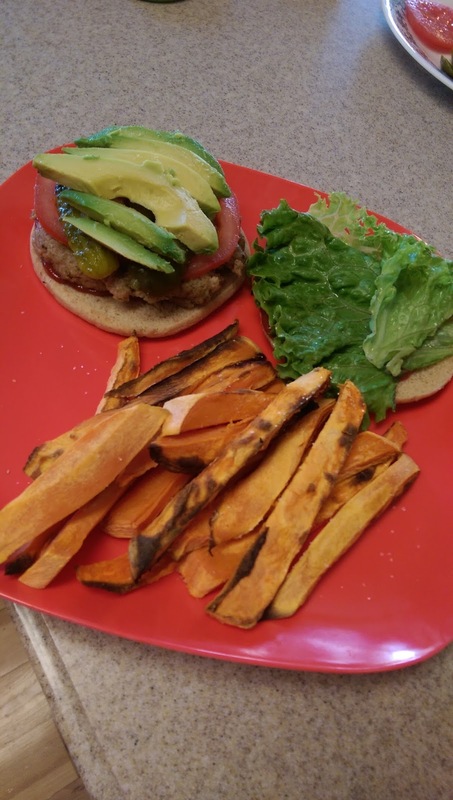 Did you guys check out Ashley’s Turkey Burgers she posted last week? I made them yesterday and oh my goodness, they were a huge hit with the family! I have a good workout for you to hit off your week with sweaty start, then you can celebrate with a burger. We have a workout at GPP that has tabatas with a run and we love it. Here is another for you! My sister and I headed to my favorite trail run last week. I recently got some new solomon trail running shoes! Truth be told I never have been a big fan of trail shoes until now. I think they are just so heavy and I just haven’t invested money into trail shoes because I do most of my runs on the road, and would retire my road shoes into trail shoes. Now, that I finally got these, I love them. I didn’t slip once! Because I’m so accident prone, these shoes made for a worry free, fast trail run. You know when you get new shoes, you tend to take care of them and not get them dirty for awhile… That is not the case for trail shoes. I may of cringed just a little bit.. I love clean shoes and am usually so OCD with new shoes for awhile. My sister helped me get over it quickly by telling me that new shoes= new adventure. –> So true! Race season is here! I have a few races I have my eye on this year. Red Rock relay Moab –> Ran this last year 18 weeks pregnant! 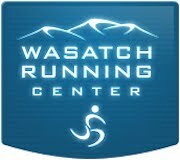 Ogden Half. –> First race post baby! St. George Marathon—>if I get picked in the lottery. If not I will do Big Cottonwood Marathon or Utah Valley. What races are on your schedule this year? Anyone else have new shoe OCD? Hi, it's Ashley. Posting for the first time on this blog. I will write up a short bio of myself when I get around to it, but I thought I'd share this recipe with you first. I actually got this idea from my husband several months ago. 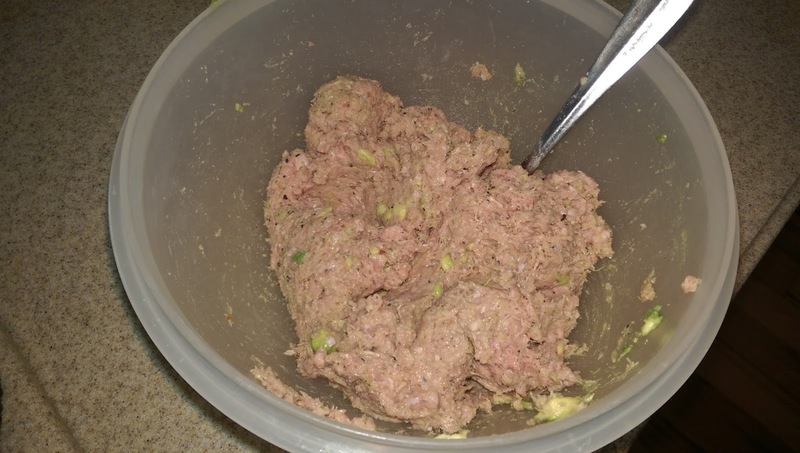 He came home from a shift (He's a fireman) and he told me that a guy had made turkey burgers for dinner the night before. He loved them so much that I had to try it out because he doesn't usually care for Turkey Burgers. I mean what man does? They just want their Beef. I asked him what was in them that made them so good. He told me what was in it but I had to figure out the ratio of everything. And that took a few times. Trial and error makes perfection, Right? 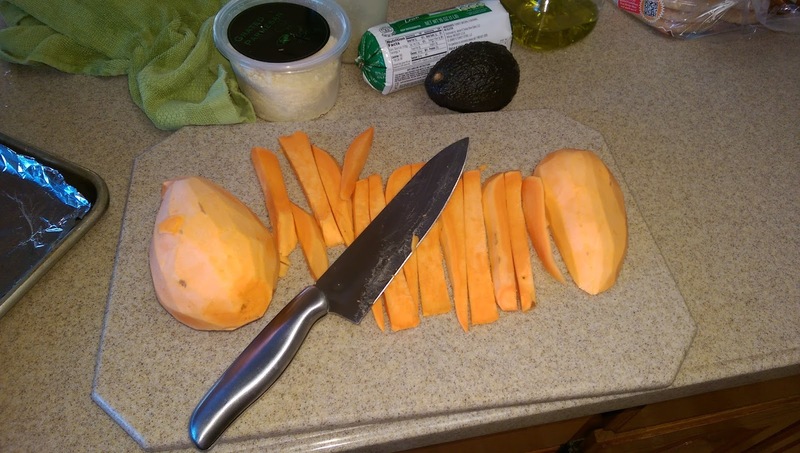 I like to have some sweet potato fries on the side when I make these burgers. So slice them up. 2 big ones usually feeds my family of 4. Line a cookie sheet with foil (for easy clean up) and spray with Olive Oil Pam. I learned the hard way and didn't spray with Pam and they were totally stuck to the foil, so we had mush fries for dinner one time. 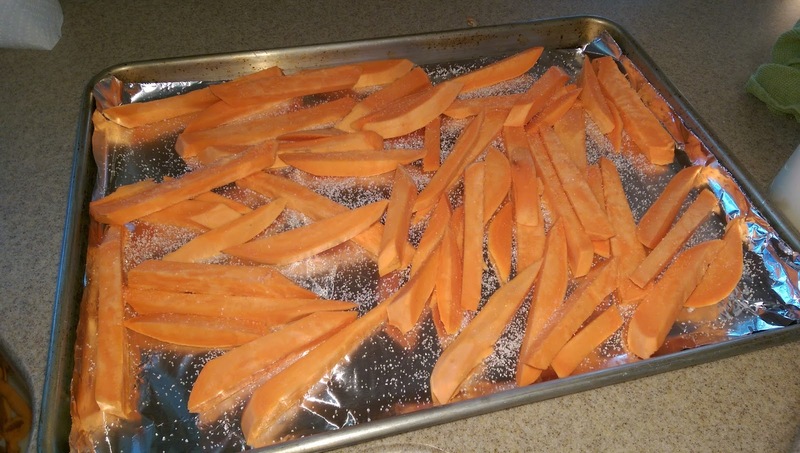 Then sprinkle with some sea salt and put them in a preheat oven on broil. Watch them until they brown and then turn them over and brown the other side. (Watch them because I burnt mine one time because I forgot about them and they were black). 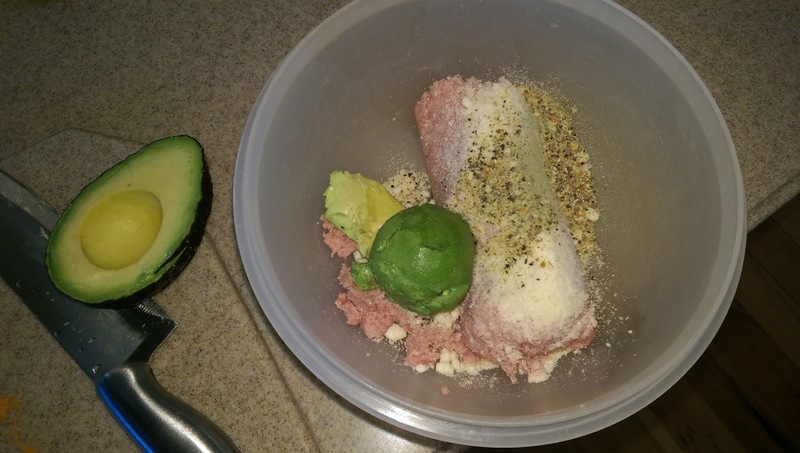 Mix your turkey burger ingredients together until the avocado is pretty mashed up. Then form into 4 patties. I like to cook mine on a George Forman Grill that has two sides to it. That way is smashes it and holds it's form. The BBQ works too, but I have found that they fall apart a lot easier that way. 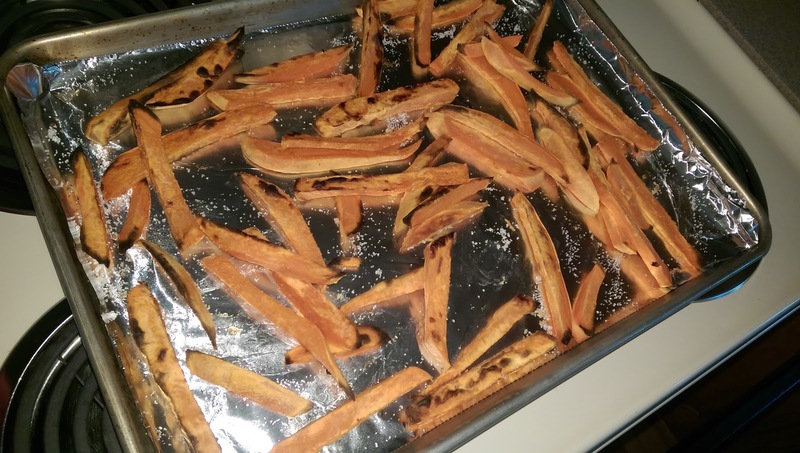 Finish product of the fries. Wa Las Dinner is served!!!!! Hey guys! Sorry to leave you hanging all week! But today I’m finally sharing the big news! There is going to be some change around here and its going to be great! Hungry Mother Runner is now Hungry Mother Runners!! 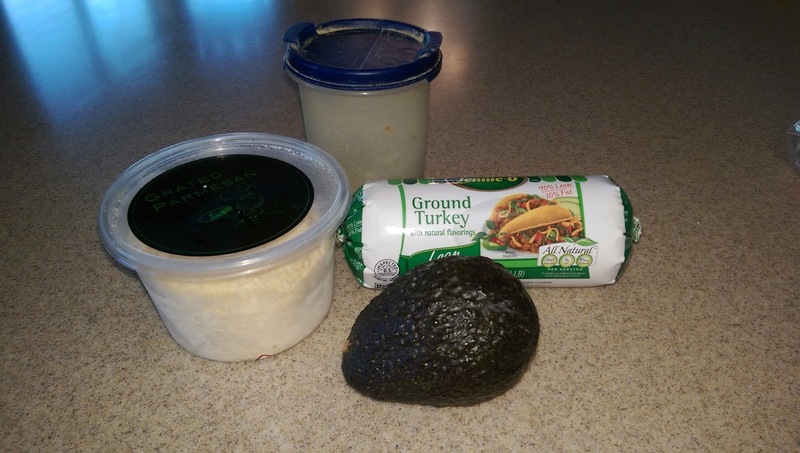 I love this blog and love sharing recipe ideas, workouts, training and the daily struggle as a mother warrior child tamer. Since I had Roen blogging has taken a backseat. I have so many aspirations for this little blog but it has proven hard to keep up with at times. So I came to the conclusion that I either just stop blogging, because I have been so inconsistent (BAD idea really..) OR bring on another blogger to add to it! Which actually sounded much better to me. I started thinking of friends that I train with and my friend Ashley was a dead give away. We have known each other since high school and she is always my go to person for healthy recipes and fitness motivation. You will all love her as much as I do! Ashley is a fitness inspiration. She has trained with GPP for 3 years and she kills it in the gym but also has fun! She uses her fitness daily and I would consider her to be an outdoor enthusiast. She loves camping, boating and hiking with her family. She is also a kitchen wizard! She loves to bake and create healthy meals for her family & me when I’m lucky. 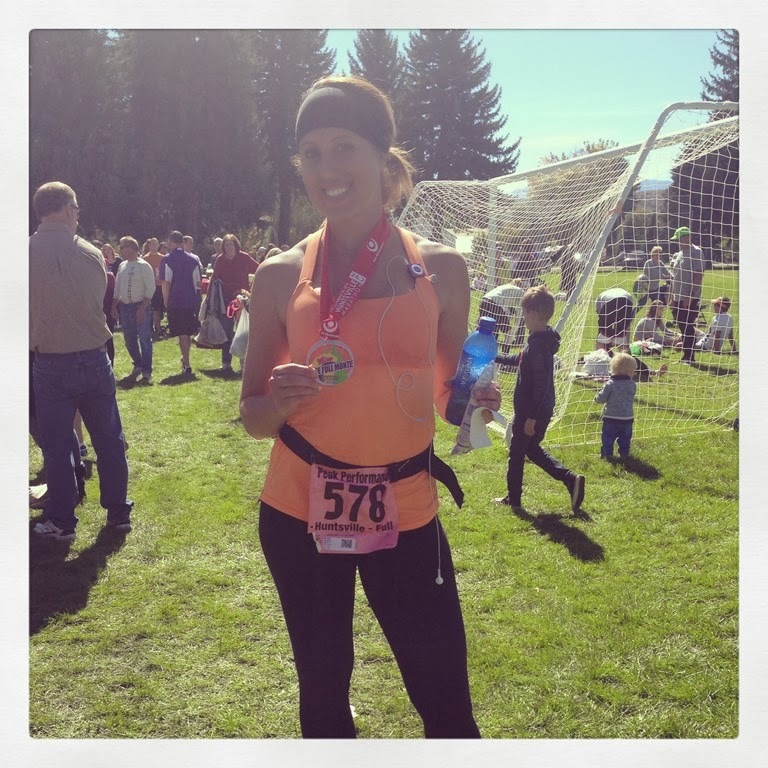 She is an accomplished triathlete, placing overall in several of her races. She has completed century bike rides and half marathons. Outside of Racing she is a Wife, mother and hair stylist! She has 2 handsome and active little boys WITH ONE MORE ON THE WAY! Ashley will be posting here, along with instagram and facebook! I’m so excited that she agreed to join me with this new adventure as Hungry Mother Runners!! There will be some changes coming to the blog obviously so be patient as we switch some things around. I hope you are off to a great start this week! I apologize for my absence here on the the blog! 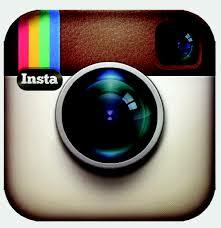 If you follow me on instagram you are getting all the good stuff. It has just been busy busy! We had a great spring break and now we are getting back into our routines! I have some exciting/BIG news for you guys coming up at the end of this week! You're going to love it! Today I want to give a refresher about TRAIL Running! The snow is melted the trails are clear and it is time to get back in the mountains! I don’t know if I have ever told you guys this, but I LOVE running the trails verses the road.. I have been doing more road/treadmill lately just because of having to train with my new babe. (Who is now 6 months old!) But I’m seriously CRAVING a good trail run. I belong in the mountains I’m sure of it. Here are my top 8 tips about hitting the trails. TRAIL RUNNING SHOES: Trail shoes are important. You could run the trails in your nice road running shoes but you are putting yourself at a higher risk for slipping and falling. Trail shoes are thicker and have more tread for stablity than your average road running shoe. They should fit snug on your heel but have some room up in your toes. Take care of them. They are meant to get DIRTY. They will get dusty and muddy. Be sure to clean your shoes, take out the insoles spray them and then stuff them with paper towels. This is the common known trail law. Hikers yield to horse, bikers yield to runners. Although if I’m running and a mountain biker is coming up the trail, I will get out of the way for them. Biking up hill is rough.. and if they have to dismount their bike because of me, I feel really bad.. I also scoot over to the side when they are flying down the hill too.. so really.. I think this needs to be revised. Ha! I’ve never had a bad experience/problem on the trail with others, just be mindful of everyone. If you go running with your dog make sure to double check if dogs are allowed on that specific trail. NOT EVERY TRAIL IS THE SAME: Every trail is different and some may branch into different ones so make sure to double check your trail map so you know your on the right track. SLOW DOWN: Trail running is a bit riskier than road especially when your heading down hills. Depending on the terrain you need to adjust your pace. What usually takes you an hour for a 6 mile run may take you up to an hour and a half to get through on a trail so time accordingly. Keep your eyes 3 feet in front of you at all times to avoid tripping. You will be switching gears throughout the trail so just be mindful of your step. Carry Water: You never know when you need it. There are no water fountains on most trails, some get lucky with a fresh spring but the majority don’t, so to avoid dehydration make sure to have water with you. I use a running belt that has a water bottle on it that is great and I can also carry my phone in the pocket. THIS is a great one. Trail Accessories: Not all trails are shaded so you may need sunscreen, don’t forget your lips!! A chap stick with an SPF can help prevent fever blisters. You may also want some bug repellent depending on the area, also a pair of gators to put around your ankles if your on a super dusty trail it can keep the dust, small rocks out of your shoes. Sunglasses or a hat are great to have too. You could also benefit from a head lamp! Cell phones aren't the greatest source if light on the trail.. Trust me.. I know! So if your headed out before the sun comes up or you know you may be wrapping it up in the dark, strap a light to your head. Now, you're lookin hot. Don’t wear headphones: I love listening to music while I’m running but after a few trail runs I found out that it prevented me from hearing people coming up behind me. So take them out and focus on your feet and surrounding. Go with a friend or 6! There is safety in numbers right? Plus it helps with the whole NO music thing..
Get outside and enjoy your backyard. It is always worth it.